Lola Greeno: Cultural Jewels is an Australian Design Centre touring exhibition. The exhibition marks the eighth in the Australian Design Centre’s Living Treasures: Masters of Australian Craft series - a biennial recognition and national tour of an iconic artist whose body of work epitomizes the best of various Australian craft fields. The first Indigenous visual artist to receive the award of National Living Treasure. Lola Greeno is a Tasmanian Aboriginal shell necklace maker, whose career spans 30 years. Greeno is well-known for her distinctly patterned, often colourful and iridescent, delicate strands of shells collected from the coastlines of Tasmania and the surrounding islands. 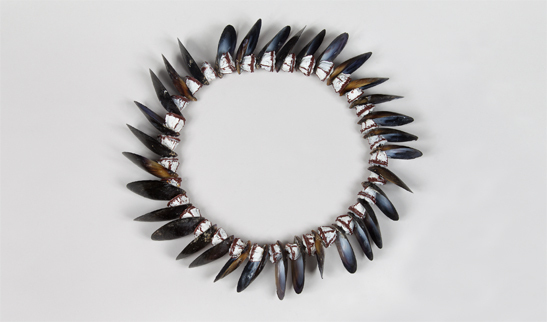 Lola Greeno’s award winning talent in shell-working is magnificently displayed in the exhibition’s 50 highly visual and textural works, each uniquely championing the traditions and culture of the Indigenous women of Tasmania’s Cape Barren and Flinders Islands. Resources to support this exhibition, including an education kit, recorded stories and a paper by Dr Julie Gough, are available at our Online Resources page.